Good morning fellow scrappers! It's a chilly crisp Autumn morning here in the North East Coast...my kind of weather!! Am sitting here at the office drinking my morning cup of coffee. Shhhhhh, don't tell the boss that I'm writing up this post at work! Tsk, tsk, tsk...however, if I don't take the time now--this post will never go up! It's a new month & with a new month comes a new challenge over at OUAS. The theme for this month is 'My Happy Place'--which can be interpreted in many ways. I interpreted it as my 'happy place' being right next to my three special guys--my family. A couple of weeks ago we took a nice Sunday stroll through the park by my house & it was the perfect weather for some photos. Luckily I was able to capture this one with all three of my boys. Catching Toby without his tongue out is just about impossible! :-) If he's less hyper he gives his 'doggy smile' but this one such day he was so happy to be outdoors & in the park no less that he was panting up a storm. So my happy place is next to my husband, son & fur-child Toby--wherever they are is where my happiness is...simple as that. I've used papers from Authentique's Strong collection & a large acrylic frame by Clear Scraps. 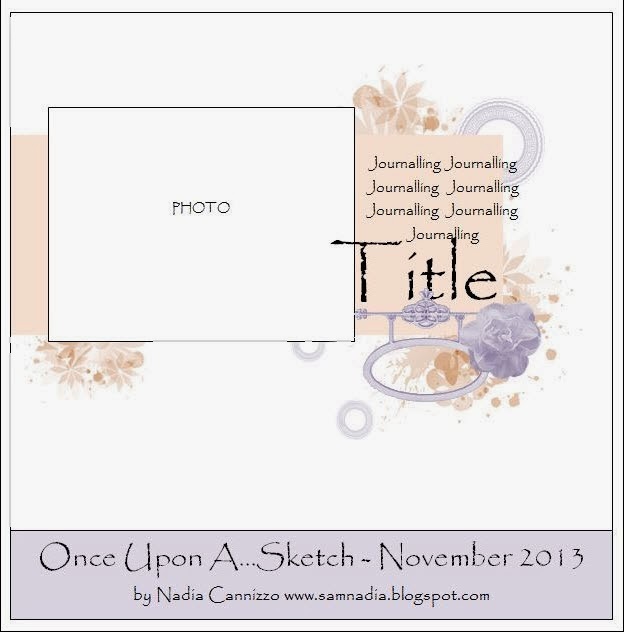 Here's the sketch provided by Nadia that I based my page on. I tend to use sketches more as guidelines and interpret the various elements on them in my own way while still keeping the basic flow of the sketch. 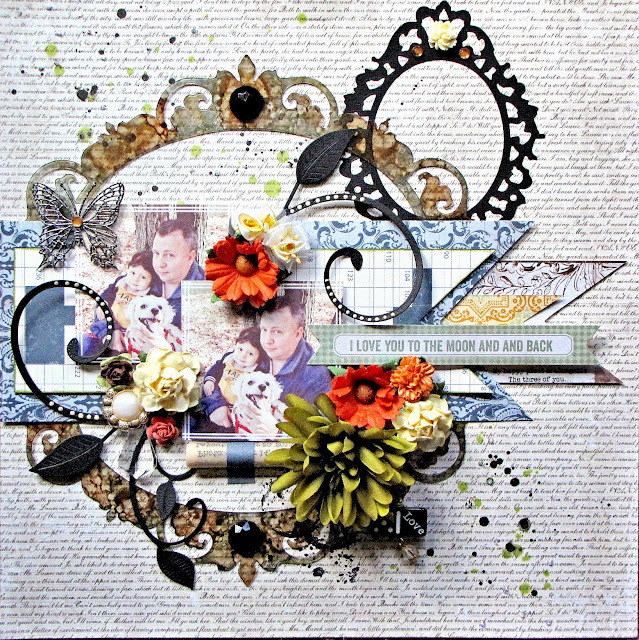 I recently got my hands on Tim Holtz's Ornate Frame Bigz die and of course used it right away! lol That's the black frame you see in the upper right hand corner. In this closeup you see how I gave the acrylic frame it's color. I used a mixture of Ginger & Meadow Green alcohol inks and applied them to the acrylic with the applicator tool. With a medium sized paint brushed I randomly splattered a bit of green & black mists along the background. At the very end I go over some of these splats with clear Stickles. This chipboard butterfly is by Imaginarium Designs. I simply inked it with some embossing ink & heat set it with Marcasite embossing powder by Stampendous. Here's my traditional & favorite form of journaling...I've once again stored my thoughts on a scroll & tucked it underneath my photo. I have a tutorial on how I make these scrolls here if interested. The large black flourish die is by Cheery Lynn. This is their Mega Fanciful Flourish die. I've highlighted some of the scrolls on the flourish with dots of Bisque Liquid Pearls. The gold & pearl button are leftover trinkets I have from the Zeus and Zoe Etsy shop. The two small yellow ribbon flowers in the upper right hand side are flowers from my stash. I have many of these & have a few bunches up for grabs in my Etsy shop. I have several of these ribbon flowers in different colors. Feel free to take a look if interested. They make for great embellishment fillers. Make sure you drop by the OUAS blog to see the other talented DT's take on this month's challenge. Take the time to play along if you can. Thanks for stopping by & have a great rest of the week!